Properties in Rock Bay average 4.6 out of 5 stars. Property 2: Large unit with Beautiful Large Patio, Quiet, Private, and Right Downtown! Property 3: Gorgeous Old Town Condo with Patio and Parking! Property 5: Seaside Escape: Enjoy your stay while relaxing in your water view suite. Property 8: Urban Oasis: Urban adventure with the comforts of home! Property 12: Come be a part of history!! Property 23: JUST LISTED, GORGEOUS, sleeps 4, air conditioning,laundry, dishwasher, and more! Property 25: Bright Studio In Old Town District. Everything At Your Doorstep. Property 34: New1 BRD absolutely unique, located in the heart of Victoria; parking inc.
Harbourside Penthouse—Spectacular Views!—Rooftop Deck, Downtown near everything! 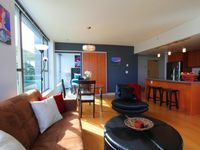 Property 45: Harbourside Penthouse—Spectacular Views!—Rooftop Deck, Downtown near everything! A great place, very close to everything. Rating Details: The property manager was very helpful. The vacation rental was spotless. I was very happy with the location. I was very satisfied with the condition of the vacation rental. Overall, I recommend this vacation rental. Reviewer Comments: We had a great time, you can walk everywhere, lot's of restaurants, close to parks and shops. Great parking spot and very attentive owners.